Irrespective of machine, tyres are probably the most important safety feature of a motorcycle or scooter and therefore it follows that they should always be inflated to the recommend pressure and be well within the legal tread depth requirements. In the unfortunate event of a puncture most tyres can be repaired. A large range of tyres is readily available and quotations for replacement can be provided, or just fitting should a customer wish to supply their own tyres. 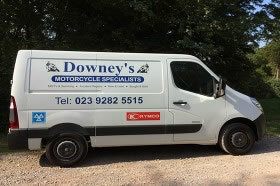 Tyre replacement and fitting for motorbikes and scooters in Portsmouth.